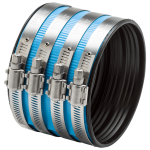 The Mission FLEX-SEAL® is the only coupling that helps you earn LEED® credits. 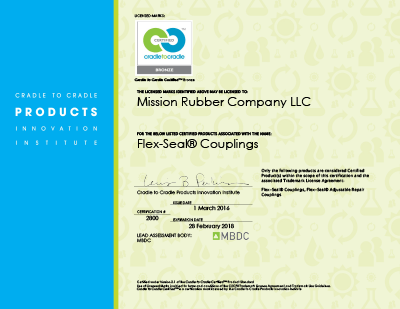 Mission Rubber’s FLEX-SEAL® Couplings have been certified Cradle to Cradle Bronze by McDonough Braungart Design Chemistry, LLC (MBDC). The firm’s Cradle to Cradle (C2C) framework is designed to take companies beyond merely minimizing harm, encouraging the creation of a wholly positive impact on the planet. 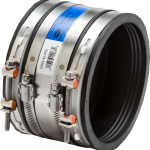 MBDC has evaluated FLEX-SEAL® Couplings for their impact on human health, environmental health, lifecycle attributes, social responsibility, renewable energy, and water stewardship, recognizing the entire product line as ecologically intelligent. MBDC was founded in 1995 by world-renowned architect William McDonough and chemist Dr. Michael Braungart. They are co-authors of Cradle to Cradle: Remaking the Way We Make Things (2002), widely recognized as one of the most consequential ecological manifestos of our time, and The Upcycle: Beyond Sustainability–Designing for Abundance (2013). MBDC created the Cradle to Cradle® design framework to help companies go beyond minimizing harm and move towards creating a wholly positive impact on the planet. MBDC leads companies beyond sustainability toward positive growth by integrating the C2C framework into corporate strategy, communications, operations, supply chains, and product designs. Using the process of inventory, assessment, and optimization, MBDC provides the technical expertise to help companies develop solutions around material health, material reutilization, renewable energy use, water stewardship, and social fairness. The firm partners with clients throughout various sectors and industries to provide scientific evaluations, spur innovation, and inspire leadership. Mission Rubber is committed to environmental responsibility and true sustainability. 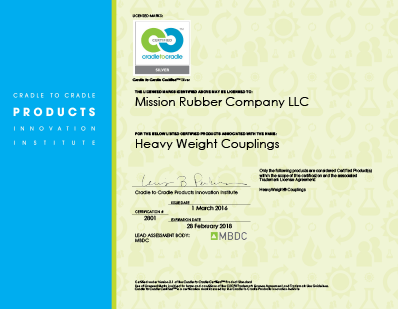 Through our Reclamation Program, customers can ship any used Mission Rubber couplings to our Corona, California facility, where they are recycled instead of discarded into impacted landfills. For more information, call us at 800-854-9991 or send us a message here. Mission Rubber is partnering with the State of California, Department of Resources Recycling and Recovery (CalRecycle) to repurpose waste tires. Select Mission products contain finely ground rubber derived from discarded tires. In the last 2 year cycle, Mission Rubber has consumed 40 thousand waste tires per year, diverting these from landfills or becoming litter in streams, roads and fields. For more information, call us at 800-854-9991 or send us a message here.